The Mi’kmaq-Wolastoqey Centre invites all members of the community to take part in its second annual Red Shawl Campaign, honouring the missing and murdered Indigenous women in Canada as well as their families. “During the month of October, we can work together to provide hope and healing for families and to reclaim justice for these women through this honouring and public awareness. 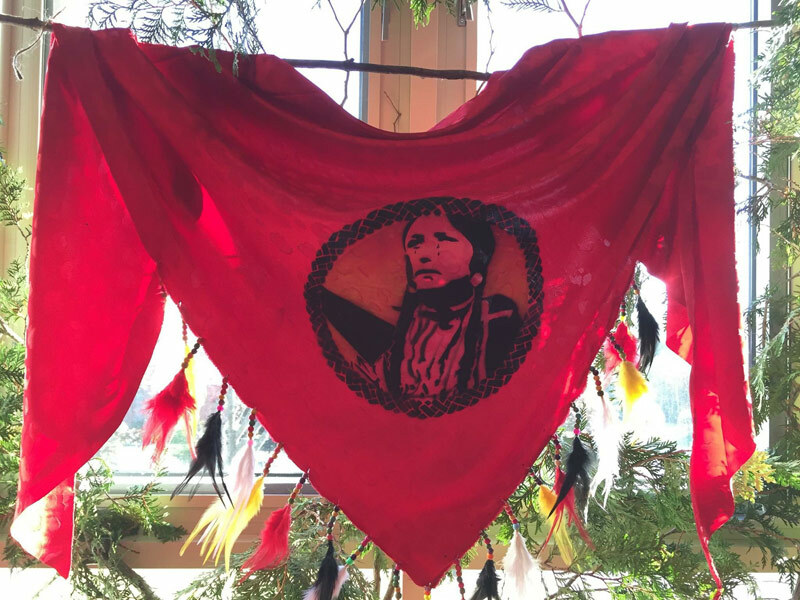 We invite all members of our communities to participate in the Red Shawl Campaign,” says Imelda Perley, elder-in-residence at the University of New Brunswick and an organizer of the campaign. “The Red Shawl is a symbol of protection – this is what a young girl earns in her footsteps to becoming a woman. When we as adult women wear shawls, as grandmothers, mothers, sisters and aunties, we embrace the gift of healing,” Elder Perley says. Opening of the Red Shawl Exhibit: Alumni Memorial Building, 9 am, Ceremony with Elder Imelda Perley. Red Shawl Healing Walk: Walkers gather at the Legislature, 11:45 a.m. Ceremony, prayer, speeches, walk, and blessing at the Government House NB. Tea to follow. Ringing of the Bells: Church communities will ring bells for ten minutes every Wednesday during the month of October. Begins Wednesday, Oct. 5, and continues on Oct. 12, 19, 26. Noon prayers on Oct. 26. Supporters who wish to contribute to the Red Shawl exhibit or the campaign are asked to call the Mi’kmaq-Wolastoqey Centre at (506) 453-4840. Those attending the memorial vigil or the healing walk are encouraged to wear red to signify their support of the women and their kinships. Community and university members wishing to volunteer during these actions may also call the Mi’kmaq-Wolastoqey Centre. Media contacts: Imelda Perley; Margaret Kress.